Row crops and yields this year are looking good so far, but that could change as soon as the weather does. A slow start on planting because of cool, wet weather doesn’t seem to have affected Missouri farmers’ crops too much, but a wetter-than-usual May brought disease damage to some who farm wheat, experts say. Frank Milde and his son, Blane, farm about 2,000 acres between Cape Girardeau and Jackson. Their land is split between corn, wheat and soybeans. The two plant as many acres of corn as they can for 30 straight days in April, Blane Milde said. Most of the time, that ends up being about 500 acres of corn, and the rest of their land is planted with wheat and soybeans. The father and son were pouring bags of bright red soybeans into tubs on the back of their 16-row planter June 18. They were given the seeds to test out on a plot of land, and soon the elder Milde was up in the tractor, methodically pushing buttons to lift and lower the equipment’s arms and lining the tractor up with a marker’s line, as he made his way up and down the field, row after row. Their corn crop is doing well, Blane Milde said, especially the small sweet corn crop he plants annually for himself, family and friends. 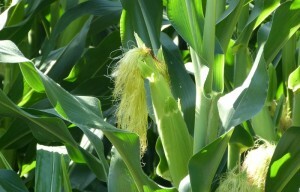 While it usually isn’t ready to eat until the end of July, his sweet corn this year was ready to eat by the end of June. The cool rain followed by the recent heat is making the corn stalks grow taller and their roots stretch deeper. The rain and its minerals have worked in the corn and soybeans’ favor, but the same can’t be said for some area wheat farmers. Because May was so wet, some farmers’ wheat crops suffered from a fungal disease called Fusarium head blight, or scab, in which spores infect wheat as it flowers. That happens easily in wet conditions, said Anthony Ohmes, agronomy specialist at the University of Missouri Extension Center in the southeast region. “Anytime you get water standing, that adds some stress,” Ohmes said. The disease has been a little more widespread throughout Southeast Missouri this year, and wheat yields probably will fall about average, maybe a little below average, he said. Though a few area farmers had to replant their corn crops because of the rain, “I’ll tell you right now the corn, because of the moisture, looks pretty good,” Ohmes said. Row crops across the state are looking good and moving toward average trend-line yields, said Kelly Smith, marketing and commodities director for the Missouri Farm Bureau. The U.S. Department of Agriculture’s 2014 Prospective Plantings report released in late March showed Missouri farmers planned to plant less corn, soybeans and wheat while increasing their cotton crops. If the humid, warm days keep up and are coupled with cooler evenings, corn’s growth really will start jumping, Ohmes said. Should the weather get too hot and windy, the corn’s silks could burn, preventing ears of corn from pollinating and developing kernels. The national average for corn yield is 166 bushels per acre. Farmers in the Missouri Bootheel will match that and may trend above, especially those farther south who use irrigation on their fields, Smith said. They often expect 200 bushels or so per acre. Corn and soybeans will continue growing through the summer, and corn will be harvested in mid-August, followed by soybeans in early October. Corn and soybeans still have several critical stages to make it through until harvest, including pollination, said Adam Thomas, grain manager at SEMO Milling and marketing committee chairman of the Missouri Farm Bureau’s office in Cape Girardeau County. A farmer can go from a wonderful start, as many are seeing now, to losing it all at once, Thomas said, and farmers don’t want to get too optimistic too early. Though some of the Mildes’ land sports wet spots, the father and son were doing what they could in June to get the rest of their soybeans planted while the ground was still moist, before it become too hot. The Farmers Almanac is calling for an August drought, Blane Milde said.